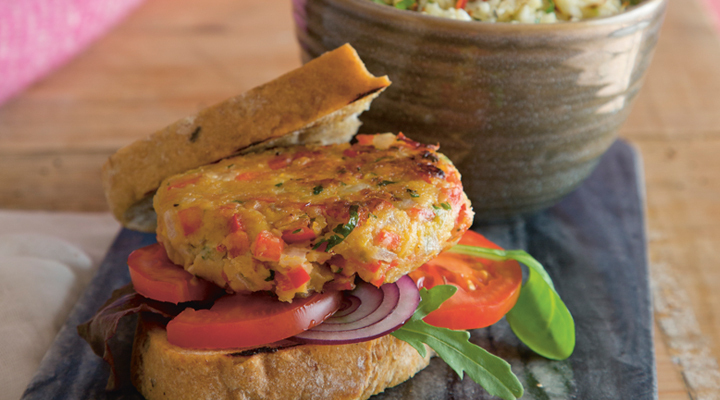 These chickpea burgers can be served with cauliflower rice with coriander and red chilli. 1. Blend the chickpeas in a food processor but don’t over blend, as you want the burgers to have some texture. Transfer to a bowl with the rest of the ingredients and stir well to incorporate the flour. The mix should be the consistency of a thick cake batter. 2. Line a baking tray with non-stick baking paper and generously dust a clean work surface with flour. Tip the burger mixture onto the counter and use the extra flour to shape into six burgers. Place on the lined tray and chill in the fridge for at least 30 minutes to help them firm up. 3. For best results, heat a little oil in a frying pan set over a medium heat and pan-fry the burgers for 15 minutes, flipping occasionally. Alternatively, you can pop the tray into the oven and bake them at 180°C/gas mark 4 for 25 minutes, turning them over halfway through. 4. Serve hot sandwiched between two thick slices of gluten-free bread and pile on some sliced tomatoes, onions and baby salad leaves. Serve with a bowl of the cauliflower rice on the side. 2. Blend the raw cauliflower florets in a food processor until it resembles rice. A cheese grater works too but takes longer. 3. Place the ‘rice’ on a baking tray and drizzle with the olive oil. You can use 2 tablespoons of water instead or melted coconut oil for a different flavour. Cook in the oven for 10 to 15 minutes, until tender. Halfway through the cooking time, add the chilli. Be sure to give everything a stir at least twice while it cooks. 4. Once your cauliflower rice is cooked, transfer to a serving bowl and stir in the chopped coriander, lime zest and juice and season with salt and pepper.